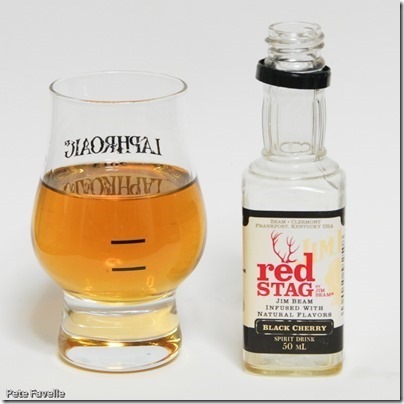 Red Stag is a range of “spirit drinks” produced by Jim Beam. Essentially, they are flavoured versions of their regular bourbon, but the fact that the bottle is careful to avoid calling the drink “bourbon” – presumably for legal purposes – makes me briefly hesitate about including them in a Whisky Wednesday. However, it’s my blog and I get to make up the rules. And if it’s based on bourbon, it’s good enough for me! This is the Red Stag Black Cherry edition, described as “a hint of black cherry for a bourbon that’s anything but subtle”. Well, as I’ve previously discovered, their regular bourbon is certainly not subtle. Those nose is overwhelmingly black cherry, with a medicinal edge that makes me think of cough sweets. A hint of the underlying honey and plenty of alcohol are present too. Watered, the cherry sweetness is reduced a little and you can just detect a suggestion of the underlying grain. In the mouth, it’s like exactly like drinking a cough sweet – that slightly artificial black cherry flavour, sticky honey sweetness and lots of alcohol heat followed by a slight antiseptic bitterness. Happily, the harsh finish in the straight bourbon is hidden by the cherry sweetness here, making it a rather pleasant (if very unwhisky like) drink. Water simply turns the volume down a little, but the flavours are all basically the same. This definitely isn’t a whisky, but if you have a cough I can see this being fantastic. 3 stars, but only for when you need it medicinally. Flavored whisky is definitely hit or miss for me. I feel like they can be more “fun” drinks, rather than a serious whisky.